Dollars & Sense: Are Free (or Cheap) Diagnostics a Myth? by The Mechanic's Wife | Feb 21, 2015 | Did You Know? You go to the doctor and tell her about all your symptoms and yet she’s stumped. She runs some tests and they all come back negative. You are sure your symptoms aren’t a figment of your imagination! Finally, someone is able to diagnose the problem and find a cure…or at least a treatment to help you cope with your symptoms. Now, even though it took many tests and lots of your doctor’s time to figure out the problem, you are at least grateful for a solution to your health issue. Your insurance company and your bank account may not be as grateful – medical diagnostics cost a lot of money! It’s a good thing automotive diagnostics are free (or at least cheap)…or are they? 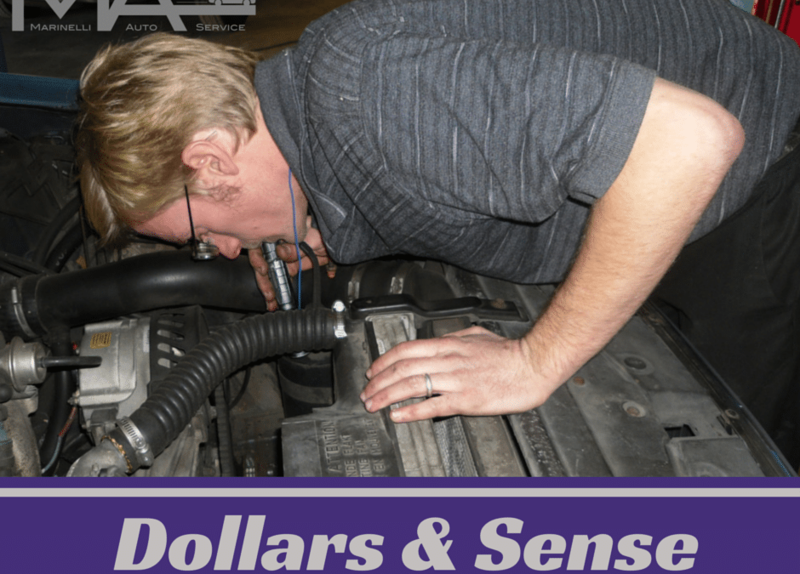 In this third installment of Dollars & Sense, I will introduce the realities of auto diagnostics, including methods used and why they’re not necessarily free (or cheap). Guess and check methods are no more effective for your vehicle than they are for your physician…unless you are ok with having surgery “just to see” if that fixes your problem. While replacing a part in your vehicle “just to see” if it fixes the problem may not be life-threatening, it is not an effective diagnostic method. Relying on understanding from past experiences. Scanning and interpreting trouble codes and live data. Performing tests and measurements with a variety of tools. How long does it take to find a diagnosis? Just like a medical test’s involvement and length depends on the symptoms, so do automotive diagnostics. While it may be as simple as a prick to the finger and a litmus strip, it could be as complicated as a 12 hour fast and a day off of work to correctly diagnose your illness. Some diagnostics are as simple as opening the hood and seeing something loose. Other diagnostics require hours of work just to access a component that needs to be tested. The time required to do it right depends on the problem. Are free (or cheap) diagnostics a myth? You could do that. They may read the codes from your car’s computer (yeah, I didn’t know my car had a computer until I married my husband) and offer a guess as to what is wrong but, as you’ve already read, this is not effective diagnostics. It can, however, be an effective way to assess the seriousness of the problem. Sometimes a mechanic can pull a code using a scan tool and have a pretty good sense of the problem right away. However, usually, to get a true diagnosis and spend the right money on the right repair – as opposed to shot-gunning parts – you need to pay a trusted mechanic for his time to figure out what’s really wrong. In my next post I’ll go deeper into how auto shops price parts and labor.